“All study no play makes Jack a dumb boy ” – This is a perfect statement for those who think extra-curricular activities are no good while studying. A student should study well but not focus only on it, rather he should also participate in other extracurricular activities. An extracurricular activity is that activity which does not relate to the professional life based on degrees. These extra activities are more beneficial when the children are enrolled in it sooner. For example, these activities play important role in shaping and directing the passion and interest of the students, apart from the degree courses. The extracurricular activities teach the practical factors of life, are self-sponsored and hence, one needs to think well before opting for anything. There are innumerable options available to choose from, as an extracurricular activity. If you are interested in certain activity then you should not step back. However, like everything else extracurricular activities come along in a package of boon and bane. The choice has always been subjective but you should consider both the factors well before enrolling. Let us learn more about it. Are you debating on whether you should take up extracurricular activities in high school or not? Have you reached no decision yet? 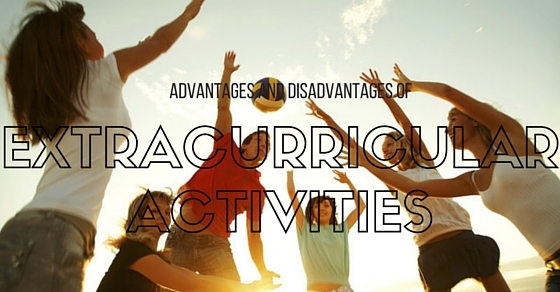 Well then, look out for these advantages of extracurricular activities in high school. Of course, no talent ever gets waste but you can enhance it by choosing an extracurricular platform. Let us look at a few extracurricular activities benefits. Time management has always been the #1 problem in the lives of many people. However, there are a few people who manage time like a pro. As a fact, they take time management as a key to success. Various successful people have opted for extracurricular activities, which benefited them in learning time management. With extracurricular activities in the schedule of the high schoolers, they not only enhance the inborn talent but also learn the “how’s” and “when’s” which refers to prioritizing things. Time management requires the capability of opting to work important things first with efficiency. Thus, extracurricular activities are the best practices that enable high schoolers to manage time effectively. Piano lessons, violin lessons, singing, western style dancing, classical dancing, skating, ice skating, skate boarding, cheerleading, sports activities, etc are some of the extracurricular activities that high schoolers opt for. If you are an observant person, you must have noticed that these talents have great diversity. The amount of variety provides options that are more diverse. This gives the perfect platform to the high schoolers to understand and explore themselves. High school is the learning ground before entering college. Self-discoveries can prepare them to face the challenges in their lives. The ability to hold on to a commitment is as important as making a commitment in the first place. Today’s corporate sectors require candidates who are committed to their career and promise an outstanding development for the company within the company. Thus, it is important for today’s generation to develop the ability to fulfill the commitments. Extracurricular activity is the best method to develop this ability in high schoolers. The students dedicate their time and manage to complete both the school work as well as the activity work. This helps them on a longer run. Have you ever noticed those children who adorably take care of their friends? How do you think they started thinking about someone else? They developed that attitude gradually with time. However, you can accelerate the learning of this attitude by enrolling your child in extracurricular activities. In extracurricular activities, they get a chance to be involved in the group with the peers. Moreover, they learn sharing and caring, all at once. Recent studies show that teenagers face a lack of confidence when they feel that they are good at nothing. Not all students can equally score great in the academic work. Similarly, it is important to make them feel like they are capable of doing something. Academic grades are not the end of the world. They need to realize that they are talented. This is only possible when you enroll them in an extracurricular activity of their choice. This will not only boost the self-confidence but also build their esteem. Moreover, working on something of their choice gives them the opportunity to master their talent. So, the purpose of extracurricular activities is to bring out the hidden unique talent of the child. Bullying has always been one of the major problems in high school years. Regardless of various initiatives, authorities have barely been able to eradicate it from the system. However, the question is that how will you prepare your child against these? Well, extracurricular activities have a solution for this. Enrollment in extracurricular activities means that the children will have a certain group that shares similar talent as them. As a result, children will find someone to confide in and talk. Moreover, the group together can be each other support against the bullying. Extracurricular activities also play an important role in improving the social behavior of the children. They learn the appropriate and inappropriate behaviors, which helps them to act according to the social norm. Indirectly it builds the personality of the children. You may agree or disagree with this fact. However, extracurricular activities push the college applications a little more than the usual one. It is safe to say that colleges prefer candidates who are capable of doing more rather than the usual bookwork. The real world is about action. It is true that action speaks louder than words but here mere mention of the extracurricular activity in the college application may increase the odds of admission. Extracurricular activities (as I have mentioned in the earlier points) shape the personality of the high schoolers in more than one way. These activities reveal many things about them. Thus, it is yet another boon of such activities. This is the best way to keep the children under supervision while the working parents are not at home. At several houses, children get back home to an empty place or spend a weekend alone. This practice is not healthy, as it gradually affects the emotional and physical state of the child. Extracurricular activities keep the children busy while the parents are busy in their offices. Hence, you kill two birds with one stone i.e. your children stay under supervision while you are not around; secondly, they do something productive in their free time. This not only helps them learn to organize but also teaches them team spirit, leadership skills, etc. There are innumerable benefits of participating in extracurricular activities. Although the negative points might never outnumber the importance of extracurricular activities, one should not neglect the bane of such. Extracurricular activities are the best way to enhance the learning experience of the school-going students. Schools, nowadays, provide various opportunities for the students to enhance their talents. However, extracurricular activities play an important role in enhancing their talents but also come along with certain shortcomings. Thus, parents and students should consider these potential drawbacks to ensure the healthy schooling experience. Time management is one of the most important factors, which the students have to consider before making any commitments. Not all students share the same ability to get work done in a given period. Thus, if you are a slow person, opting for an activity, which requires a lot of energy and hours, it may create troubles for you. This may also affect your grade at school. As a result, schooling experience will start deteriorating day by day. However, you can tackle this problem by opting for an activity that allows you to manage time. For example, you can work on your extracurricular activity once or twice a week. You might end up choosing something that requires attention once or twice a week. However, you can hardly ever deny the urge to do something that you love compared to other priorities. Similarly, you prefer a tempting escape against the usual schoolwork. Consciously or unconsciously, you deny the academic priorities to live the passion. For example, your extracurricular activity is skating. It is natural for you to keep on procrastination your school homework. This on a long run can affect the academic performance, which may lead to a fall in grades. Thus, the biggest drawback of these activities is the priority crisis for some students. Extracurricular activities require commitments, as these tasks are in addition to the regular schooling days. Thus, the first thing that comes to the mind while choosing an extracurricular activity is that activity is something of your interest. Nothing can be compared to the frustration of an unwanted activity. For example, if dancing is something you do not prefer even if it has a good scope you would barely make it. Hence, if you choose something merely out of blue, without any interest or passion for the activity, it will prove to be a waste of time for you. Play time is an important period for the early schooling kids. As a fact, playtime in itself helps in learning many things without being taught. For the children of the pre-primary section, play time works as a learning ground for teamwork and sharing. However, it is not limited to learning values but also terms like shape, size, depth, etc. But, when this playtime is replaced by a strict schedule, it kills the free time. This may help your children adapt to the activity of your choice but it will also diminish their self-discovering attitude, carefree imagination, etc. Unknowingly this structured and planned life will make your child burdened at a young age with frustration and workload. Over-schedule or back to back activities can increase the stress level at a very young age. Thus, you should not force young children into a tight schedule with no escape. Extracurricular activities come along with their own expenses too. Regardless of the activity you chose, an expense is required. It may be the cost of an instrument for the music lesson or the uniform or clothing for the dance. Similarly, skating activity requires good quality skates. Previously schools provided equipment and charged some fees. However, nowadays parents have to go an extra mile to provide for the extracurricular activity of their wards. Moreover, these expenses do not stop at buying the necessary equipment. You also require paying the learning fees, registration fees, etc. Thus, these activities come along with various expenses (in disguise sometimes). Have you ever felt like you have totally exhausted yourself? You feel like your day went on and on without any break. That is the feeling you get when you experience a tight, never-ending schedule. Similarly, when your children go through a tough and tight schedule, which leaves no free time, it may lead to frustration, tiredness, and exhaustion. This does not only affect the academic performance but also the health of your little one. Thus, extracurricular activities are extra in nature and should be limited. Participating in a committee to improve things around like school, hospital. Visiting retirement and orphanage homes. Being a part of student radio station or the student council. College life is a beautiful phase in our life and everyone will be having few memories that they always cherish during this phase. We usually have lots of fun in our student life and moreover, if you are good at extra-curricular activities along with your academics then it is plus point for you. You can easily get admission into any of the colleges for higher education if you are an active participant in extracurricular activities. As in college, extracurricular activities can be made mandatory in schools as well. There are several schools which give importance to extracurricular activities along with academics and also motivate students to participate in their interesting activity. As per a survey, it is said that if your resume comprises of extra curricular activities, then it can turn out to become very effective while attending interviews. It helps in making your resume impressive and worthful. Thus, we can conclude that extracurricular activities play an important role in shaping the future of the children. Hence, parents, as well as the children, should look forward to these activities without neglecting any pitfalls. Considering all factors is vital and essential for the better development of the children. Moreover, even studies have proved the role of extracurricular activities in education creates a positive change in the students. It reduces the number of dropouts from the school; it also lessens the odds of criminal offenses. It indirectly gives an appropriate mindset that helps in focusing on the betterment of one. Moreover, the drawbacks also have loops in them, which enable you to create a solution against it. It is an overall solution to the various problems faced by the children. Also, it is a perfect ‘trial and error’ learning ground for the learners.